What is the TEQs system? Can you explain TEQs really quickly and concisely? Isn’t TEQs just rationing by another name? Why do I sometimes see TEQs referred to as DTQs (Domestic Tradable Quotas)? Haven’t I heard of David Fleming in some other context? What is the progress towards seeing TEQs implemented in the UK? Hasn’t the UK government already evaluated TEQs as part of its feasibility study on Personal Carbon Trading? How can I help make TEQs happen in my country? What would happen to someone who ran out of TEQs units before the end of the year? TEQs units are electronic, so what happens if I don’t have a credit/debit card, or I forget it one day? Or what if I’m a tourist, with no Entitlement of units? Would international travel or public transportation be included in the TEQs system? If TEQs was implemented in one country, wouldn’t there be a problem with the carbon ’embedded’ in goods imported to that country? Wouldn’t this give an unfair advantage to foreign manufacturers of goods, who don’t have to buy TEQs units? Would TEQs mean that the Government would know about everything we buy? What’s to stop someone cornering the market by buying up large quantities of TEQs units, temporarily taking them out of circulation to push up prices, and then selling them at huge profit to a desperate country? Why do you believe that TEQs would motivate and empower communities in an energy transition better than alternative approaches? I see that most of society would want low prices, generating a sense of cooperation and common purpose around reducing energy demand. But wouldn’t those energy-thrifty individuals who regularly sell part of their TEQs Entitlement want higher prices, undermining that common purpose? I see the need for something like energy/carbon rationing, but why make it tradable? Why is TEQs explicitly a national system – don’t we need this globally? Why do we need to wait for Governments – can’t we do this voluntarily/locally? What’s the difference between TEQs and PCAs (Personal Carbon Allowances)? Why do TEQs only cover fuel and energy? Surely we need to manage the carbon in all products and services? Isn’t it simpler to limit carbon emissions ‘upstream’ (via the energy suppliers) rather than ‘downstream’ (via the energy consumers)? That way you would only have to regulate and involve a relatively small number of companies, rather than every individual in the country. You also wouldn’t have to calculate embodied emissions for every product. Why use TEQs rather than carbon taxation? Isn’t this just an extension of the money-spinning ‘Cap and Trade’ carbon-trading fiasco? Isn’t there a lot of potential for fraud with a system involving tens of millions of consumer transactions, meaning that TEQs would require heavy regulation and policing? Wouldn’t TEQs require that everyone becomes a proficient trader in TEQs units – and isn’t that unrealistic? Wouldn’t introducing quotas for buying energy risk people instead cutting down their local forests etc to heat their homes? Isn’t this just another way for the Government to interfere with our personal choices and personal lives? After taxes on air flights and rubbish bins that watch what we put in them this really is the last straw. I am a firm believer in technology, and the exciting improvements in efficiency/solar/wind/nuclear fusion/tidal/biomass etc will overcome both climate change and energy resource depletion anyway, so TEQs solves a non-existent problem! Important issues raised there are added to this page. Sure. It’s a system to guarantee that a nation meets its emission reduction targets, while ensuring fair access to energy for all. Take a look at our How would TEQs work? page for a quick ten-point explanation. You’ll also find a video presentation of the system there. Yes and no. The word rationing contains two intertwined meanings. The first is guaranteed minimum shares for all, the second is limits to what individuals are allowed to consume. Many of us resent the second, but in times of shortage we cry out for the first. TEQs is rationing in the welcome sense of the word, as it guarantees minimum shares for all, but is not rationing in the unpopular sense, as it allows individuals to exceed their basic Entitlement (if they are willing to pay those who use less for the privilege). And of course, rationing is in any case a response to shortage, not the cause of it. It may not deserve its bad name. The purpose of TEQs is not to limit consumption per se, but rather to share out fairly the shrinking energy consumption available under our national carbon budget – to allow the maximum possible freedom of lifestyle choice without destabilising our climate. Without a TEQs system the available resources simply go to the richest (“rationing by wealth”), leaving less well-off individuals and groups without any way to secure the energy they need. With TEQs everyone is guaranteed a basic Entitlement, and those who use a below-average amount of energy can also gain an income by selling unneeded TEQs units (which can then be purchased by those using more). When David Fleming first published an outline of the system in 1996 he used the name DTQs (Domestic Tradable Quotas). This was later changed to TEQs (Tradable Energy Quotas) due to confusion caused by the word “domestic” in the original title. While intended to distinguish the system from international trading schemes, it was sometimes misinterpreted as implying that the system covered only household emissions, rather than the entire national economy. Very possibly. For more on his wider vision and influence see his Wikipedia entry, or take a look at his popular – and extraordinary – books, posthumously published by Chelsea Green Publishing in September 2016. Although the late Dr. David Fleming first proposed the system in 1996 and it has long been Green Party policy, it gained a higher political profile in 2006, when expressions of interest from successive Labour Secretaries of State for the Environment (and from senior Conservative politicians) culminated in David Miliband’s announcement of a government-funded feasibility study. The 2008 Climate Change Act also grants powers allowing the UK Government to introduce TEQs at a later date without further primary legislation, though in practice further legislation would almost certainly be used due to the wide-ranging significance of the system for the national economy. Clearly public opinion and many political factors will influence the decision on such a move, which is why we are working to spread understanding of the system as widely as possible. The carbon budgets agreed under the Climate Change Act mandate 50% cuts in UK emissions by 2025 (relative to 1990), but we see no way that those targets can actually be achieved without a TEQs framework. While we welcomed this additional research in the field, we believe that a number of important errors are contained in the cost-benefit analysis, and that DEFRA’s consequent decision to delay a full feasibility study into the TEQs system is ill-advised in the absence of other realistic and effective means for addressing climate change and fuel depletion. Our detailed critique can be viewed here (PDF format), and sits alongside other critical responses from the UK Parliament’s Environmental Audit Committee, the Institute for Public Policy Research and the Centre for Sustainable Energy on our Key Research page. A summary of the key points made across these reports can be found in Chapter Six of 2011’s All Party Parliamentary Group report into TEQs. A brief summary of the flaws in the feasibility study can also be seen in the next answer below. Meanwhile, Norfolk Island (off Australia) is pushing ahead with a trial, and influential supporters continue to get behind TEQs in the UK, as can be seen in the quotes at the top of our media page. In April 2015 the Carbon Management academic journal published a new peer-reviewed paper by three of our directors. This contains a valuable “Political history of TEQs” (from p.420), while the rest of the paper explores the growing evidence that achieving the legally-binding emissions cuts mandated by the Climate Change Act may be impossible without TEQs. We continue to participate in the ongoing academic, political and technical discussions required to bring TEQs to fruition. See our Mailing List page to be kept up-to-date with the latest developments, or to view our news archives. See Help make TEQs happen for how you can support the campaign. The UK Government’s feasibility study concluded in May 2008 and represented a useful addition to the body of research in the field, with positive findings on technical feasibility, public acceptability and distributional impacts. However, the Government decided not to continue its research programme at that time on the basis of the study’s unfavourable cost-benefit analysis. In personal communication we have been told that the Department of Energy and Climate Change feels it has “thrown down the gauntlet” to the research community to show that costs would be lower, or benefits higher, than found in the feasibility study. Both of these have now been amply demonstrated, and this evidence is laid out in our detailed critique of the study, and updated in Chapter Six of the All Party Parliamentary Group (APPGOPO) report into TEQs. In short, while the brief for the feasibility study was to examine TEQs, the cost-benefit analysis in question failed to do that, examining instead a system covering only the emissions of individuals, and which would not provide guaranteed entitlements to energy. It also put an unrealistically low value on emissions reductions, as well as explicitly ignoring TEQs’ benefits in terms of shifting perceived norms in acceptable behaviour, creating a sense of common purpose and spurring innovation through creating a predictable demand for low-carbon solutions. As this one-page extract from the APPGOPO report clearly shows, taking even a few of these factors into account in the calculation would have produced a favourable verdict on TEQs. It should also be noted that while the cost-benefit analysis in question assumed the benefits of a system covering only individuals, it used the (already inflated) cost estimates given in Accenture’s analysis of a full TEQs system designed to cover the whole economy. “Personal carbon trading could be essential in helping to reduce our national carbon footprint. Further work is needed before personal carbon trading can be a viable policy option and this must be started urgently, and in earnest. In the meantime there is no barrier to the Government developing and deploying the policies that will not only prepare the ground for personal carbon trading, but which will ensure its effectiveness and acceptance once implemented. The wider political context around TEQs is outlined in the “Political history of TEQs” (from p.420) in this 2015 peer-reviewed paper. Take a look at our page for supporters for a number of ways you can support the campaign, and/or get in touch. As the TEQs system is not based on an annual issue of units, there is no ‘end of the year’ in this sense. Instead, TEQs units are issued into the economy week by week. In addition, on day one of the system’s implementation a year’s supply of TEQs units would be issued. This initial year’s supply will always remain in the system, acting as a ‘float’. For more detail, see pp.20-21 of Energy and the Common Purpose or Chapter One of the All Party Parliamentary Group on Peak Oil’s report into TEQs (both available as free downloads). This is no problem. Say you are at a petrol station – they will simply charge you for your fuel in cash, and include the cost of buying TEQs units to cover your purchase (at the current national price) in the price they charge you. In other words, they effectively buy the necessary TEQs units on your behalf and pass on the cost to you, all in one straightforward cash transaction. This might vary from country to country, just as government benefits and incentives for raising children do currently. TEQs would not limit a country’s decision making as to how best to share out its energy/emissions budget. A national government’s decision on Entitlements for families with children would depend on their population policy, but the operation of TEQs would be unaffected – the system would operate in exactly the same way whether children received 100% of an adult entitlement, 0%, or anything in between. You would not have to surrender TEQs units in order to buy travel tickets – they are only surrendered for your direct fuel and energy purchases. However, the company providing your train/flight/ferry etc would have to surrender TEQs units in order to purchase the fuel that their vehicles require. This raises the question of whether international travel companies could simply buy their fuel in countries that have not yet implemented TEQs. The answer is that any fuel brought in from countries which are not meeting their agreed climate obligations would be subject to import tariffs – an idea that is now mainstream politics, as discussed in more detail in the next answer below. The first thing to say is that manufacturers in a country with no effective climate policy in place will actually lose out in the medium-term, as their nation will be failing to adapt to the reality of a low-carbon, energy-efficient future. This would leave them more vulnerable to energy supply disruptions and wild price fluctuations, and to falling behind the rest of the world in innovation. However, in the short-term, it is true that as TEQs helps a country to integrate the true value of carbon/energy into its everyday economic life – and as society adapts to this – there are likely to be associated costs, which could disadvantage the country’s international competitiveness. The ideal way to address this would be to have a TEQs system in each nation, so that such ’embedded carbon’ would always be accounted for within a robust national budget. However, given that TEQs will almost certainly be implemented by some nations before others, import tariffs will be necessary to ensure that these countries’ manufacturers are not disadvantaged during this transition period. These tariffs will generate revenue for the importing countries, and this will provide a strong incentive for the exporting countries to themselves implement TEQs or a similar policy, so that they can collect this revenue, instead of letting it flow overseas. Such import tariffs were once regarded as politically unthinkable, but – as demonstrated by this 2008 speech from the then President of the European Commission, José Manuel Barroso – that has not been the case for some time. There is of course a third option – allowing domestic industries to suffer in those countries that act responsibly, but that is even more unthinkable than tariffs. The World Trade Organisation have admitted that such tariffs are permissible under their rules. Indeed, even the central piece of global warming legislation considered by the US Congress was designed to “levy punitive tariffs on greenhouse-gas-intensive products imported from countries that lack ‘comparable action’ to that of the US, starting in 2020″. Industrial lobbies and unions argued that any such sanctions should take effect more quickly. With the President of the European Commission, the French President and industrial chambers of commerce all strongly advocating a similar tariff scheme, many analysts predict that the EU will adopt some form of green tariff scheme in the coming years. For more detail on the intellectual and political battle over such tariffs, see this piece from the Bruegel think tank. No. You would only need to surrender TEQs units when buying fuel and electricity (and this is often done by direct debit anyway). There are far greater privacy issues around the use of credit/debit cards, for example, than there are around TEQs. Our rich purchaser would effectively find money flowing rapidly from their own pocket to people’s pockets around the country. The more units the speculator purchased, the higher the price would go and the more their purchases would cost them (while others continued to receive TEQs units for free). In other words, the more they speculate, the more money they lose. Thus the design of the TEQs system creates an in-built pressure for the national price of TEQs units to fall back into line with real, practical demand for (carbon-rated) fuel and energy. Before long the price would come back down. By pushing up the price of something that others are getting for free, our speculator would have achieved nothing besides losing a deal of money. The fact that a free entitlement to TEQs units is guaranteed to every adult in the country – no matter the current national price – provides resilience and reassurance. We currently have no such assurances over energy prices or supply, and accordingly the existing system may indeed be vulnerable to market speculation. In short, TEQs would make the domestic energy market more resistant to being cornered than it is at present. Behavioural studies have consistently shown that intrinsic motivation (that is, desiring the actual consequences of undertaking a task) drives us more effectively than extrinsic motivation (being rewarded for doing something, or penalised for not doing it). For Daniel Pink’s entertaining presentations on this research see his TED talk or RSA animation. The important Common Cause report (Sept 2010) considered motivation with regard to environmental issues in particular, and reinforced this conclusion. But this understanding has largely failed to penetrate climate policy, which is generally based on classic ‘carrot and stick’ ideas about motivation. TEQs is designed to harness our developing understanding of human drives and passions, and is built around the principle of common purpose – aligning individual and collective aims, so that the actions which benefit the individual are also of benefit to the wider community, and vice versa. There is already an intrinsic motivation in reducing energy demand once the reality of our energy/climate challenge is understood – TEQs would bring that reality home to people in a clear and unambiguous way, encouraging them to plan ahead, to cooperate with others and to take the risk on inventive solutions. Importantly, the national TEQs Budget is set in terms of the scarce goods themselves – carbon, energy, and specific named fuels. These assets have money values, of course – all assets do – but TEQs units are not defined in terms of money: they are energy units. The Budget clarifies the existing necessity for all energy-users, collectively and individually, to get by on a diminishing supply of high-carbon energy. And, day-to-day, the national price of TEQs units will provide a readily understood and widely publicised measure of how well the nation is progressing towards a low-carbon energy future – the lower the price, the better. If the price of TEQs units starts rising, this will provide a clear signal that we collectively need to do more to achieve our aims. It also makes it transparently in people’s interests not just to find ways to reduce their own energy use, but also to pressure and assist the local Council, supermarket etc to reduce theirs. Motivations are aligned and it is clear that we are all in this together. This topic is examined and evidenced in more depth in the “cross-sector engagement, motivation and collaboration” section (from p.418) of this 2015 academic paper on TEQs. Not if they are perceptive. Even individuals who routinely sell some of their TEQs Entitlement will ultimately benefit from a lower TEQs price, as the TEQs price is a key constituent of the price of energy in the country. Since the energy price affects the prices of all products and services in the economy, the temporary personal benefit of selling one’s TEQs units at a higher price would soon be eaten up by the higher cost of everything you buy. Besides, if the rest of society is working to reduce energy demand, it would be a self-defeating exercise for an individual to start burning energy wantonly in an attempt to drive up the TEQs price! Not only would they find themselves very unpopular, they would also be out-of-pocket very quickly. The beauty of TEQs is that it aligns individual interests with the collective interest. The reasons for making TEQs units tradable are twofold. Firstly, prohibiting the exchange of rations in the past has always led to substantial black market activity, unnecessarily criminalising otherwise law-abiding individuals. Secondly, energy demand differs from food demand; while we all require comparable amounts of food, certain vocations intrinsically require more energy. For this reason a non-tradable equal entitlement to energy would simply destroy many professions. With tradable rations those who live within their TEQs entitlement can sell their surplus onto the market, rewarding their energy-thrift and increasing the supply for those who need to purchase additional units. Since the poor use less energy than the rich, the system would also be redistributive. Effectively dealing with the global challenges of climate change and peak oil certainly calls for a global framework, but TEQs is ill-suited for this role. TEQs does one thing, and does it well – enabling nations to guarantee achieving their targets for emissions reduction while ensuring fair access to energy. Such a guarantee is essential to the effectiveness of the many global frameworks (Contraction And Convergence, Greenhouse Development Rights etc.) which aim to set fair national emissions budgets for all the world’s nations. They would require something like TEQs to sit underneath them, to actually implement these budgets. But a single global TEQs budget would be unfair and unsuited to the wide diversity of conditions between individual states. Energy users would be constrained by a budget which had no relation to their nation’s current needs and dependency, and the system would become swamped with massive flows of money between energy consumers in different nations. Instead, TEQs operates on the national scale, as it is built on David Fleming‘s insight that: Large-scale problems do not require large-scale solutions; they require small-scale solutions within a large-scale framework. TEQs, operating as the smaller-scale system within a larger (global) framework, itself provides the larger (national) framework for smaller-scale (local) energy descent plans. The national and local scales are important because TEQs is designed to encourage collective motivation at a scale where personal efforts are seen as being significant, and where there can be a meaningful sense of collective common purpose – of “we”. Adequate global agreements are important, but they become utterly meaningless if they do not ultimately stimulate changes at the local level where we all live out our lives. TEQs bridges the gap between the two. There has been extensive interest in pilots or local implementations of TEQs, from local groups keen to get started (like the CRAGs), from policy-makers keen to trial the idea (like Tim Yeo MP), and from research groups exploring the practicalities (like Australia’s Southern Cross University). However, the idea of a local implementation does face serious challenges, such as boundary issues (people popping out of the locality to buy their fuel), the limited duration of any trial undermining its long-term signalling effects, and the lack of national cooperation and common purpose. The UK Energy Research Centre have produced a study on this topic, and we agree with them that there is no way of accurately simulating a TEQs system in a local trial. However, we also agree that local projects based on TEQs can provide useful insights into some of the practicalities of the system, and are a good way for communities to engage with our climate/energy challenges and develop awareness and understanding of both these and of TEQs. We welcome contact from those interested in getting involved. The most significant difference is that PCAs (described in Mayer Hillman’s 2004 book, How We Can Save the Planet) would only apply to individuals, while TEQs is designed to include all energy users within the economy, including individuals as well as all organisations from small businesses to the Government. Somewhat confusingly, the term “Personal Carbon Trading” (PCT) is widely used as a catch-all to refer to both systems. There are several problems with a design that applies only to individuals. Firstly, it would undermine the sense that as a society “we’re all in it together” and that everyone is pulling their weight – the energy descent requires cooperation between businesses, households, local government etc, and this will only be achieved if there is a sense of common purpose. Also, if only some of the participants in the economy were required to surrender PCAs when they purchase fuel and energy, fuel would effectively carry two different prices, depending on who the buyer was. If you were to turn up at a garage in your car to buy petrol, you would be paying a different price for it than someone who showed up in a commercial vehicle, and whose energy- consumption was not covered (or was covered by another system). Different prices for the same fuel would immediately lead to black market brokerage, and the system would either break down or require very expensive enforcement and anti-fraud measures. Finally, a PCAs system would also necessarily lack the self-monitoring elegance of TEQs. This characteristic is a product of the fact that the very TEQs units surrendered by energy consumers at, say, a petrol station are then surrendered by the petrol station when it buys its fuel from a fuel supplier. And when the fuel supplier applies to produce or import fuel, it surrenders these same units back to the agency that they originated from. This cycle (illustrated here) means that every recipient of TEQs units needs to surrender those units later. The units flow through the economy just as energy does. Consequently, it is in no-one’s interest to ‘let someone off’ surrendering their TEQs units, just as it is now in no retailer’s interest to let someone off paying them in cash for their fuel or electricity. We know that the police are not required to watch every cash transaction in the present economy to ensure that money has changed hands, and individual TEQs transactions will go on in just the same bureaucracy-free, surveillance-free way. Shaun Chamberlin, one of our directors, has written a piece on his own website exploring the significance of the distinction between TEQs and the generic term ‘Personal Carbon Trading’. We do indeed. And, sure enough, a system which is like TEQs but covers all products and services has been thought about (see Tyndall Centre, 2005). It was termed, catchily enough, the “Rate All Products and Services” or RAPS system, but the Tyndall Centre researchers who came up with the idea quickly realised that it would be impossible to produce the necessary carbon rating for the full lifecycle of every product and service in a national economy. But fear not. TEQs does effectively cover all purchases in the national economy, while rendering all the intricacies and absurdities of carbon rating every product unnecessary. How? Through the insight that energy is required for all economic activity, and so by managing the flow of (carbon-rated) energy through the economy, you can also manage the emissions in the production of other products. An example will make this clearer. Imagine you want to buy a bed. This purchase will not require the surrender of any TEQs units (as it not a purchase of fuel or energy), but the manufacturer of the bed will have had to purchase TEQs units to cover the energy they used in its production. And the company that transported the bed to the shop, or to your home, will have needed to purchase TEQs units too. These companies will ultimately pass on this cost to their customers, like you. Accordingly, you will find that products and services provided in a low-carbon way will simply cost less, in cash. So while the process of making purchases is as straightforward as ever, consumers will find that the cheaper option is more often the lower-carbon option. In this way, TEQs manages the total amount of fossil carbon burnt in the national economy, while avoiding the need to carbon rate everything (only rating a few fuel and energy sources is necessary), or to measure emissions at exhaust pipes or factory chimneys. At first sight this seems a convincing argument. However, ‘upstream’ regulation fails in one important regard – it does not engage the general populace in the changes required. While this might seem a benefit in terms of simplicity it means that the fundamental changes required in society are not going to happen. Energy suppliers alone are not going to be able to implement the Lean Energy transformation needed (see pp. 23-24 of Energy and the Common Purpose), we need every citizen to see the need to change the way we live, work and play. TEQs actually provides the best of both worlds – it encourages the entire population to ‘own’ the problem and respond to it accordingly, but without creating a complicated system for those individuals to grapple with. The carbon-ratings applied to fuel and energy sources are indeed calculated upstream, as is only sensible, making all the endless complexities of ‘carbon labelling’ products, measuring emissions and calculating ’embodied energy’ unnecessary (for more detail on this see pp. 21-24 of Energy and the Common Purpose or Chapter One of the All Party Parliamentary Group on Peak Oil’s report into TEQs). And since the companies that produce consumer goods have to buy TEQs units to cover the (carbon-rated) energy they use in producing them, the costs for more energy/carbon intensive products will be higher. Individuals and companies are then faced only with simply-priced choices for their everyday purchases, which happen to be more expensive the more carbon-intensive they are. Pages 17 & 18 of the All Party Parliamentary Group report on TEQs outline the significant benefits of TEQs over typical carbon taxation. In addition, it must be noted that all carbon taxes are not created equal. We consider the Fee and Dividend proposal to be the gold-standard in terms of an upstream, tax based climate policy. It would be a great improvement over existing policy, but would still fall short of engaging the whole of society in the necessary transition to low-carbon living. Our Managing Director, Shaun Chamberlin, has produced a readable, concise comparison of TEQs and Fee and Dividend, based on discussions with the Citizens’ Climate Lobby – chief advocates of Fee & Dividend. This is true, but then under what alternative solution would this not be true? Short of abolishing capitalism, the essence of being rich is that you can afford to buy more of any given thing than those with less money. At present there is nothing to stop the rich buying all of a scarce energy resource, leaving none for anyone else. TEQs, crucially, would make things a lot fairer. Everyone in the country would be guaranteed an equal entitlement to energy, regardless of wealth. If an individual chose to be energy-thrifty and sell part of her entitlement (at the prevailing national price) then she would benefit financially, and whoever purchased the right to use that energy instead would effectively be paying her for the privilege of doing so. This is clearly fairer than the current setup, under which those with low-carbon lifestyles do not benefit at all from the energy-profligacy of others. It also means that the system would benefit the poor – a number of studies of TEQs have confirmed that the poor use less energy/carbon on average than the rich, and so would benefit financially. Government modelling of the distributional impacts of TEQs has found that 71% of the lowest-income households would benefit from TEQs, while 55% of the highest-income households would be worse off. However, there would be a minority of low-income households which would be worse off (perhaps due to factors such as medical conditions, cheap and inefficient appliances, lack of control over home insulation etc). These households are likely to be in no position to deal with being worse off, and so we advocate (as do the Government studies) that a ‘benefit’ or other compensatory measure be introduced alongside the TEQs system. This would be easily funded from the revenue to Government that would be generated by the Tender of TEQs units. Further research has been conducted by the Centre for Sustainable Energy considering the best ways of aiding any such disadvantaged poor households. Overall, though, the key point is that the vast majority of poor households would be financially better off with TEQs, even before any such benefit, as well as being guaranteed an entitlement to energy. No. In fact, TEQs provides perhaps the only viable alternative to that price-based approach of trying to reduce emissions by making them more expensive. Instead, TEQs simply sets a firm – and declining – limit on the quantity of carbon coming into the economy (and explicitly guarantees fair entitlements to the energy that is available within that cap). Society as a whole can then collectively focus on adapting within this limit, and thus keeping the price of energy as low as possible, which is a simply-understood task that everyone can buy into with enthusiasm. This resolves the contradiction at the heart of mainstream energy/climate policy – the desire to raise carbon prices to address climate change, while keeping energy prices low. We live in a world where over 80% of global energy still comes from fossil fuels, and so energy and carbon prices remain stubbornly linked. Accordingly, price-based approaches simply hurt the poorest – both globally and within nations – as the deliberate raising of the price of carbon/energy makes energy unaffordable for many, effectively ‘rationing energy by wealth’. We need to replace these so-called ‘market-based frameworks’ (such as the ineffectual EU Emissions Trading Scheme), with a framework within which the market is constrained. TEQs provides this, utilising trading for what trading does well, but not allowing the market to regulate its own appetites. No amount of money can match the inherent value of maintaining a benign climate. The heart of TEQs is a non-negotiable respect for the limits set by physical reality, alongside a framework to harness the collective genius of the populace in thriving within those limits. For an extensive exploration of price-based approaches vs. TEQs, see this 2015 academic paper on TEQs. In fact, a particularly elegant feature of the TEQs design is that it is largely self-monitoring. This characteristic is a product of the fact that the very TEQs units surrendered by energy consumers at, say, a petrol station are then surrendered by the petrol station when it buys its fuel from a fuel supplier. And when the fuel supplier applies to produce or import fuel, it surrenders these same units back to the agency that they originated from. This cycle (illustrated below) means that every recipient of TEQs units needs to surrender those units later. The units flow through the economy just as energy does. That might well be unrealistic, but the TEQs system requires nothing of the sort. TEQs is designed as a ‘hands free’ system, with the majority of transactions automated and requiring no extra time and effort at all. Since TEQs units are only required for direct purchases of energy, utility bills and fuel purchases are likely to be most people’s main direct engagement with the system. Utility bills are already easily paid by direct debit, and the TEQs cost of fuel purchases could either be paid together with the cash cost via a credit card linked to an individual’s TEQs account, or a separate TEQs card could be carried and swiped alongside the money transaction. If an individual needed to buy additional TEQs units the cost of these would simply be added to their bill at the point of energy purchase. Also, as there would be a single national price for TEQs units at any given time, no individual or company would need to ‘haggle’ or bargain for their requirements. They would simply buy or sell at the prevailing price, just like topping up a mobile phone or travel smart-card (such as London’s Oyster cards). So while people would be aware of the limits set on the national economy and the need for energy thrift, the practicalities of the TEQs system itself would not trouble them at all. 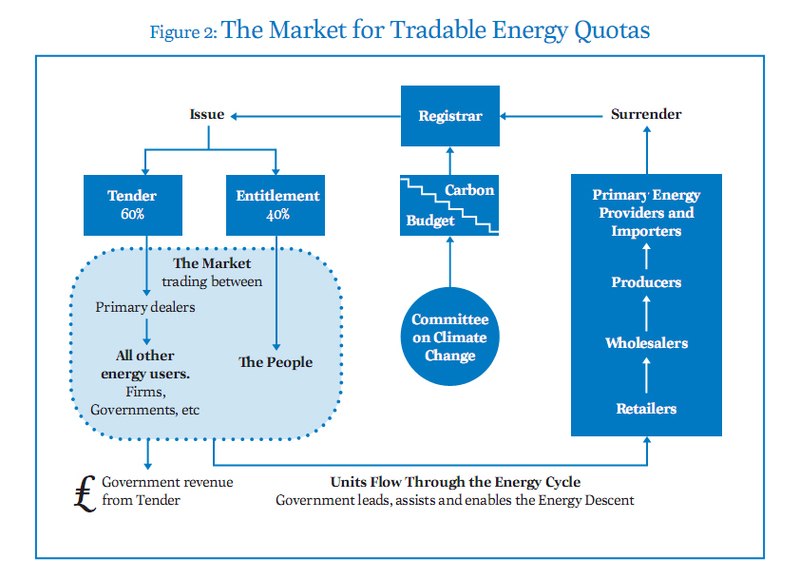 This is based on the assumption that TEQs would make it more difficult or expensive to buy energy. On the contrary, however, TEQs is designed to prevent energy prices rocketing beyond the reach of the majority, and to unite society in keeping prices as low as possible. With oil prices having tripled over the past decade, it would not be a surprise if more people were already turning to gathering wood from local woodlands to heat their homes. And energy prices are set to continue rising. While introducing TEQs could cause a rise in prices in the short term (as the market adjusts to the inclusion of the true costs), in the medium and long term it will very much bring them down. It will also guarantee entitlements to energy for those who might otherwise be priced out of the energy market (and so forced to turn to alternatives), and leave the vast majority of poor households better off. TEQs, then, would encourage the preservation of woods and other valuable potential energy sources, since the threat to them comes not from TEQs, but from the very energy trends that TEQs is designed to address. Quite the opposite. TEQs defends individuals’ and organisations’ rights to make their own choices about what is important to them. You can still choose to be profligate in your energy use, but you will have to pay those who do not for the privilege. On the other hand, if you reduce (or have already reduced) your energy usage, you will be rewarded in line with the wider benefits your actions bring. The TEQs system also ensures that as a nation we are dealing with the greater issues of climate change and resource depletion, and so ensures that more draconian measures – which could well severely constrain personal freedoms – are not required. If so then no-one would be more delighted than us. But there is no contradiction here – if there are energy sources or improvements in efficiency so potent that they will solve all our problems then the social framework and incentive structure provided by TEQs will help push the development and implementation of such ingenious solutions to happen even more quickly. For any questions not answered here, try starting a discussion in the TEQs Forum.